On February 11, 2008, Channel 2 News Chicago interviewed Cody and I for a 3 minute special they were doing on artificial dyes on the 10 o’clock news. They came out to our house for about 3 hours. 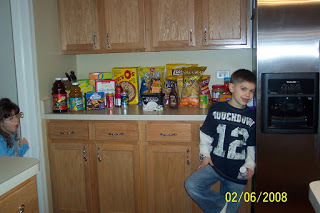 Above is a picture of Cody in front of a spread of Feingold acceptable foods that they taped. To view the video, you can click on the link below. If that doesn’t work, go to www.cbs2chicago.com and type in “Hyper Ingredients” in the search box. They have an article there, and on the right you can play the video. I posted the article that they wrote below. Cody Davis’s behavior improved dramatically after his mother began restricting the food additives he eats. There’s something in our food that could be affecting your child’s behavior, and could even be causing behavior problems in children who’ve never had them. 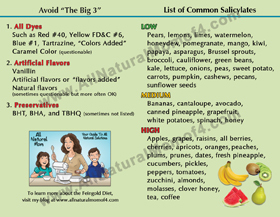 CBS 2 Medical Editor Mary Ann Childers reports there’s new research parents need to know about some hyper ingredients. In preschool, 3-year-old Cody Davis was in constant motion. He was hyperactive, aggressive and a trouble-maker. “One time they called me and just said he’s hurting other kids at school just because he’s so wild, he can’t control himself,” said Cody’s mother, Sheri Davis. On the Internet, Davis stumbled on something she didn’t expect: a link between behavior and food dyes. “And that’s when I started looking at what he was eating,” she said. Now, a highly regarded British study says a variety of common food additives — including yellow dyes 5 and 6 — can make kids hyper. And the findings are not just in children who have been diagnosed with attention-deficit hyperactivity disorder. In the study, most of the 300 children exposed to artificial colorings had some increased level of hyperactivity. “It may impact actually the general population, not just ADHD persons, but the average child,” said Dr. Thomas Blondis, M.D. of the pediatrics department at the University of Chicago’s Comer Children’s Hospital. 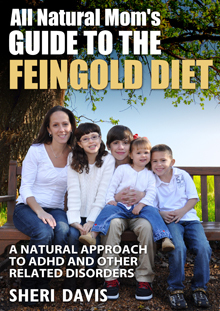 The link between additives and behavior was first made in the 1970s by an allergist named Dr. Benjamin Feingold. He developed a diet that many families use and many doctors recommend to this day. Davis believes Cody was especially affected by red dye #40, and when she eliminated it from his diet she noticed an almost immediate difference. 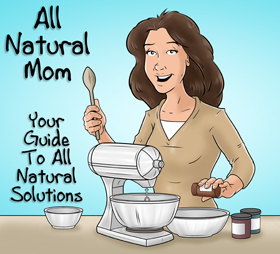 The hyper ingredients are found in everything from beverages to baked goods. Davis shops now for more natural versions colored by fruit and vegetable extracts so Cody can still eat foods he loves — even cheese curls. Sugar, in moderation, is not a culprit for causing hyper behavior. ADHD expert Dr. Mark Stein, Ph.D. says he thinks a hyperactivity reaction to food dyes is not that common, but it’s not a bad idea to go for natural over artificial. “You know, it certainly wouldn’t harm a child to reduce food dyes, and pay attention to what they eat,” Stein said. Now age 7, Cody is winning awards for his excellent behavior in school. This latest research prompted the British equivalent of the Food and Drug Administration to issue an advisory to parents that they should reduce foods with additives if they see changes in their child’s behavior. The FDA, which regulates additives in the U.S., has taken no action. 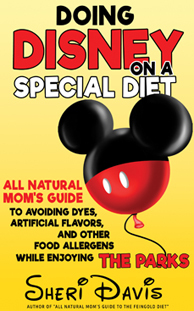 However, the Center for Science in the Public Interest recommends that parents avoid food dyes, especially yellow 5 and 6. I was extremely sick for most of my pregnancy with her, they took her 2 weeks early and she was a horribly colic baby for a very long time. Now, as a toddler her behaviors are becoming out of control and she consumes all of our energy and emotions. I'm a special education teacher and deal with behavior issues on a daily basis and I feel like a failure as a parent. She is extremely impulsive, loud, demanding, indecisive, stubborn, mean to her friends at times and just seems like she can't control some of her actions. It makes me so sad because she can be so sweet and loving and is too smart for her own good. I'm just lost and am willing to try anything. Anyway, could you please share with me a good place to start or point me to a good site to get me started with diet issues. I continue to pray about things and I just feel like God sent me here for a reason and I hope that I can learn some things to help my Ava. Hi Kristi. I'd love to help. Send me an e-mail at sheridavis27@comcast.net. I can't seem to find yours. Thanks.